SharePoint: April 2019 cumulative updates are now available! April 2019 Cumulative Updates (CU) for SharePoint 2010, SharePoint 2013, SharePoint 2016 and SharePoint 2019 are now available. In order to install April 2019 CU for SharePoint 2010, it’s required Service Pack 2 for SharePoint 2010. In order to install April 2019 CU for SharePoint 2013, it’s required Service Pack 1 for SharePoint 2013. KB 4464510 – April 2019 Update for SharePoint Server 2016 (language independent) – This is also a security update! There was no fix released for Office Online Server this month. Download April 2019 Update for SharePoint Server 2016 (language independent) – This is also a security update! There was no fix released for Office Online Server 2016 this month. KB 4464518 – April 2019 Update for SharePoint Server 2019 (language independent) – This is also a security update! Download April 2019 Update for SharePoint Server 2019 (language independent) – This is also a security update! SharePoint: Disponibles las actualizaciones acumuladas de Abril de 2019! SharePoint & Office 365: Compilation of blog posts (XXIV)! A new month is starting so this is a new summary of the blog posts written in English that I published last month in my blog. SharePoint: March 2019 cumulative updates are now available! Office 365 How restore a deleted channel in Microsoft Teams (I)! Office 365: New options to change the look in modern SPO sites (II)! Office 365: New options to change the look in modern SPO sites (I)! Office 365: Adding new columns between existing columns in SPO lists (II)! Office 365 Adding new columns between existing columns in SPO lists (I)! Office 365: New Office App for Windows 10 (II)! Office 365: Changing section background in modern SPO pages (II)! Office 365: Changing section background in modern SPO pages (I)! Office 365: New user experience to create Teams in Microsoft Teams (II)! Office 365: New user experience to create Teams in Microsoft Teams (I)! Office 365: New Office App for Windows 10 (I)! Office 365: New version of the SPO Management Shell (March 2019) released! Office 365: New Microsoft Flow Flows in ODFB (II)! Office 365 New Microsoft Flow Flows in ODFB (I)! Office 365: Reminder Flow for SPO lists and document libraries (II)! Office 365: February 2018 version of SPO CSOM just released! Office 365: Reminder Flow for SPO lists and document libraries (I)! Office 365: New Office 365 Icons are here (II)! Office 365: New Office 365 Icons are here (I)! Office 365: Teams Usage reports in the Teams Admin Center (II)! Office 365 Teams Usage reports in the Teams Admin Center (I)! Office 365: How to share a modern SPO page by e-mail (II)! Office 365 How to share a modern SPO page by e-mail (I)! Office 365: New site settings panel in modern SPO sites (II)! Office 365: How to update SPO user profiles properties with PowerShell (II)! SharePoint & Office 365: Compilation of blog posts (XXIII)! SharePoint & Office 365: Compilation of blog posts (XXII)! SharePoint & Office 365: Resumen de posts (XXXL)! Como siempre, después del recopilatorio de enlaces interesantes, es momento del resumen de artículos publicados en este blog durante el mes de marzo de 2019. SharePoint: Disponibles las actualizaciones acumuladas de Marzo de 2019! Office 365: Como recuperar un canal borrado en Teams (I)! Office 365: Llega el soporte “nativo” de archivos Autodesk a SPO y ODFB! Office 365: Nuevas opciones para personalizar el aspecto de sitios modernos de SPO (II)! Office 365: Nuevas opciones para personalizar el aspecto de sitios modernos de SPO (I)! Office 365: Añadiendo nuevas columnas entre columnas existentes de listas de SPO (II)! Office 365: Añadiendo nuevas columnas entre columnas de listas de SPO (I)! Office 365: Nueva Aplicación de Office para Windows 10 (II)! Office 365: Nueva experiencia de usuario para crear Teams en Microsoft Teams (II)! Office 365: Nueva experiencia de usuario para crear Teams en Microsoft Teams (I)! Office 365: Nueva Aplicación de Office para Windows 10 (I)! Office 365: Disponible la actualización de marzo de 2019 del SPO Management Shell! Office 365: Disponible la versión 1.8 de SPFx! Office 365: Nuevos Flows de Microsoft Flow en ODFB (II)! Office 365: Nuevos Flows de Microsoft Flow en ODFB (I)! Office 365: Flow de Reminders en Listas y Bibliotecas de Documentos (II)! Office 365: Disponible la versión del CSOM de Febrero de 2018 para SPO! Office 365: Flow de Reminders en Listas y Bibliotecas de Documentos (I)! Office 365: Llegan los nuevos iconos a la home de Office 365 (II)! Office 365: Llegan los nuevos iconos a la home de Office 365 (I)! Office 365: Informes de uso de Teams en el Microsoft Teams Admin Center (II)! Office 365: Informes de uso Teams en el Microsoft Teams Admin Center (I)! Office 365: Compartir páginas modernas de SPO por correo electrónico (II)! Office 365: Compartir páginas modernas de SPO por correo electrónico (I)! Office 365: Nuevo panel de configuración en sitios de SPO (II)! SharePoint & Office 365:Recopilatorio de enlaces interesantes (XLIV)! 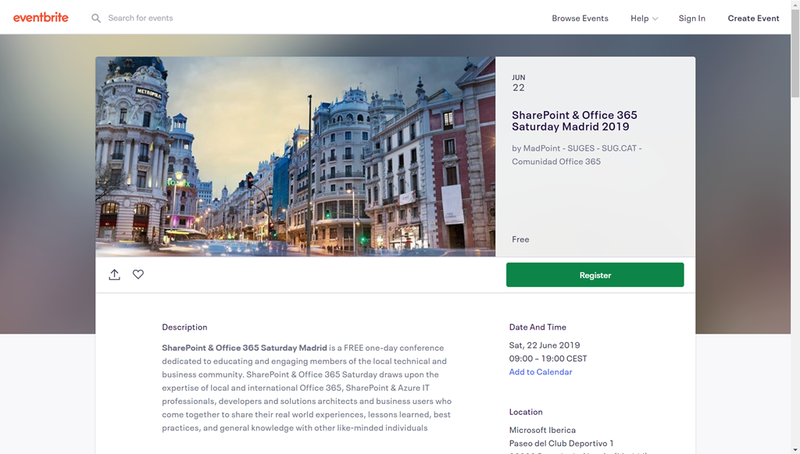 [Eventos]: No olvides registrarte en el SP & Office 365 Saturday Madrid 2019! OneDrive and Microsoft Flow – Better Together! SharePoint Framework v1.8.0 – What’s in the latest Update of SPFx? Whiteboard in Teams meetings integration, ink grab and ink beautification are here! Estrenamos nuevo mes y toca compartir con todos vosotros la 44ª Edición del recopilatorio de enlaces interesantes sobre SharePoint y Office 365. Espero que os sea de utilidad. En unos días esperamos comunicar la parrilla de speakers seleccionados para el evento, tarea que va a ser dificil tanto por el número de sesiones que estamos recibiendo como por la calidad y contenido de las mismas. ¡Te esperamos el próximo 22 de junio en Madrid! Office 365: Herramienta Configuration XML Editor para despliegues de Office! Office 365: Llega la nueva experiencia de migración desde GMail a EXO! Office 365: Los Document Sets comienzan a modernizarse en SPO! Office 365: How to provide access to files and folders in SPO and ODFB (II)! Office 365: Como dar acceso a archivos y carpetas en SPO y ODFB (II)! Office 365: How to provide access to files and folders in SPO and ODFB (I)!